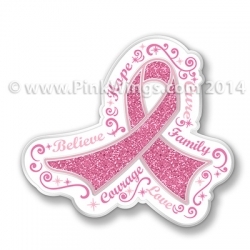 This fantastic pink ribbon pin is 1 1/4" tall. The ribbon is glitter and has the words Believe, Hope Cure, Family, Love and Courage around the ribbon. These pins are set to arrive at the end of September. Pre-order yours today! !